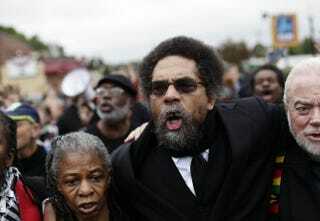 Cornel West (center), along with other demonstrators protesting the shooting death of Michael Brown, marches to the Ferguson police station in Ferguson, Mo., Oct. 13, 2014. In his response to Michael Eric Dyson’s recent critique of him, West has chosen to focus on issues like Ferguson and deflect from their personal falling-out. What’s more important: two academics debating each other’s relevancy or the plight of the black and poor in America? Cornel West seems to think it’s the latter, or at least that’s how he has posited himself in the brewing war of words between himself and former friend Michael Eric Dyson. While Dyson took to the New Republic to publish his critique of his mentor, “The Ghost of Cornel West,” Sunday night, West chose the less flashy route: a Facebook post. Dyson, who has known West for at least 35 years and considers the academic his mentor, very publicly outlined why the two had fallen out in the New Republic story and in an interview with The Root, claiming that West’s highly personal attacks on President Barack Obama, as well as attacks on other activists and academics who have defended the president, including Dyson, had led to West’s loss of credibility in the eyes of many. After Dyson’s story dropped, many wondered what West’s response would be to the Georgetown professor’s lengthy, often pointed, yet personal critique of the Princeton scholar. Dyson himself speculated that West would be unlikely to match his response because of West’s less-frequent written output (“He doesn’t write”).